Hyperbaric Oxygen Therapy (HBOT) is a medical treatment in which the patient is entirely enclosed in a pressure chamber breathing 100% pure oxygen (O2) at greater than one atmosphere pressure. Air contains nearly 21% oxygen, and approximately 78% nitrogen. In hyperbaric oxygen therapy (HBO), the oxygen percentage breathed by the patient is nearly or actually 100%, almost five times more than in air. The pressure of the oxygen breathed by the patient in a hyperbaric oxygen chamber is usually more than 1.5 times (and can be as much as 3 times) greater than atmospheric pressure. HBOT can deliver nearly 15 times as much oxygen as there is in air at normal pressure. 2. What are the physiological mechanisms of action caused by HBOT that make it work? Hyperoxygenation: HBOT physically dissolves extra oxygen into the blood plasma, which is then delivered to the tissues. Breathing pure oxygen at two to three times normal pressure delivers 10-15 times as much physically dissolved oxygen to tissues. This can increase the tissue oxygen in compromised tissues to greater-than-normal values. Hyperoxygenation has been demonstrated to induce formation of new capillaries in ischemic or poorly perfused wounds. Therefore, it is useful in the treatment of ischemic based compromised wounds, flaps and grafts. It is also helpful in some infections by allowing white cell (leukocytic) activity to resume function. Mechanical Effect of Increased Pressure: Any gas in the body will decrease in volume as the pressure on it increases. With a threefold increase in pressure, a bubble trapped in the body is reduced by two-thirds. Thus, reduction in gas volume resolves air embolism and decompression illness when the diagnosis to treatment is done in a timely manner. Vasoconstriction: High-pressure oxygen causes constriction of the blood vessels in normal tissues without creating hypoxia. It does not cause constriction in previously oxygen-deprived tissues. The vasoconstriction decreases edema which is helpful in the treatment of burns, crush injuries, compartment syndromes and other acute traumatic ischemias. Even though the blood flow that contributes to edema is reduced, oxygen delivery to the tissues is maintained through the hyperoxygenation effect. Antimicrobial Activity: HBOT inhibits alpha toxin production as seen in anaerobic infections such as clostridium perfringens (gas gangrene). The most common cause of gas gangrene is clostridium perfringens; however, there are several gas producing organisms (aerobic and anaerobic) that require surgical debridement initially. It also enhances the white cell killing activity which provides an excellent adjuvant to I.V. antibiotic and local wound care. Mass Action of Gases: The flooding of the body with any one gas tends to “wash out” others. This action occurs more rapidly under pressure than under ordinary conditions, and makes HBOT an indicated treatment for decompression sickness. Reduction of Reperfusion Injury: Following an ischemic interval, indirect injury occurs, which is mediated by the inappropriate activation of leukocytes. HBOT prevents such activation. Adherence of white blood cells to capillary walls is markedly reduced, thus mitigating the “no reflow” phenomenon. This is why HBOT therapy is indicated in carbon monoxide poisoning and is considered the treatment of choice. 3. What are the clinically accepted indications for Hyperbaric Oxygen Therapy? 4. Is HBOT therapy reimbursed by insurance? If therapy is performed within the accepted indications published by the Undersea & Hyperbaric Medicine Society and as viewed by the Health Care Financing Administration, therapy is normally reimbursed. Like all medical services provided, some private and all managed care providers require pre-authorization. 5. What is it NOT used for? 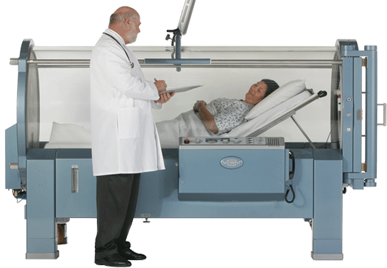 Similar to all treatment modalities, HBOT is not used for diseases where there is no clinical evidence that it works. There have been claims that HBOT might help with problems like aging skin or to prolong normal healthy life. Those have not been documented nor accepted in the wider medical community. 6. How is a hyperbaric treatment administered? By definition, hyperbaric oxygen therapy is administered to a patient in a pressurized chamber. The hyperbaric chamber is a steel, aluminum or clear plastic room in which air can be compressed to a pressure that is greater than sea level. There are basically two types of chambers, monoplace and multiplace. Monoplace Chambers: A monoplace chamber is a system that accommodates one patient at a time. The patient lies down on a stretcher which slides into the chamber. Typically the chamber is pressurized with 100% oxygen. The patient receives 100% oxygen by breathing the oxygen inside of the chamber. A mask or a hood is not needed. Monoplace chambers have the capability to be pressurized to 3 ATA. Other than decompression sickness and gas embolism, the UHMS protocols for hyperbaric therapy do not require greater than 3 ATA of pressure for treatment. Critically ill patients requiring extensive life support equipment can be treated in the Sechrist monoplace. (Other monoplace manufacturers do not offer all the life support capabilities). The vast majority of hyperbaric patients are treated in a monoplace chamber. Multiplace Chambers: A multiplace chamber is a system that can accommodate two or more occupants. Patients can either walk or be wheeled (sitting or lying down) into a multiplace chamber, depending on the size. Typically, an attendant is inside with the patients. The chambers are pressurized with compressed air through a dedicated supply system. 100% oxygen is delivered to the patient via a mask or a hood assembly. Multiplace chambers have the capability to be pressurized to 6 ATA. Higher pressures may be desired in treatment of decompression sickness and air embolism cases. 7. How long is a hyperbaric treatment? Except for decompression sickness and arterial gas embolism, the typical treatments are approximately two hours long. Treatments are administered on an in-patient or out-patient basis. In some acute cases, treatments may be administered every eight to twelve hours. 8. How many treatments are needed? A patient’s clinical response and other factors often dictate the number of treatments required. Emergency cases, such as carbon monoxide poisoning, arterial gas embolism or decompression sickness, may only require one or two treatments. Non-healing wounds may call for as many as 20 to 30 treatments. 9. What does a hyperbaric treatment feel like? Generally, the patient will not feel differently. However, during certain parts of the treatment, the patient may experience a sensation of fullness in the ears, similar to the feeling experienced on an airplane. This is a result of the eardrum responding to pressures changes. Prior to treatment, the patient will be taught a few easy methods to “clear” his or her ears to avoid discomfort. 10. How does a patient prepare for a hyperbaric treatment? A patient must wear 100% cotton garments during a treatment. Personal items are not allowed in the hyperbaric chamber. For additional information see the what not to bring into a hyperbaric chamber link. 11. What are the possible side effects? Lung problems in rare cases, the lungs have become irritated by the oxygen, and the patient develops a dry cough that is resolved once the treatment is stopped. In extremely small number of cases, some patients have developed non-life threatening issues. Overall, HBOT is a safe procedure. 12. How does a physician prescribe HBOT? All potential hyperbaric chamber patients must have a prescription from a referring physician in order to receive hyperbaric treatments. 13. Is physician supervision required? In order for HBOT to be covered under the Medicare program in the United States, the physician must be in constant attendance during the entire treatment. 14. Are there standard HBOT protocols? Treatment protocols are established by the attending physician. Safe treatment times, dose and pressure limits have been established for hyperbaric oxygen exposure and these limitations form the basis for all treatment protocols. While receiving therapy, the critically ill patient may be provided with mechanical ventilation, IV therapy and invasive and noninvasive physiological monitoring. Please click here for additional resources and information about hyperbaric medicine, or you can submit a question to us and we will promptly return an answer. 15. How do I clean and disinfect chamber and gurney? Wash Disinfect the chamber according to the type of cases being treated and as directed by the medical staff. Wash the chamber and all gurney, stretcher and mattress surfaces with an approved disinfectant or mild dish washing soup. Click here for a detailed list of approved chamber disinfectants.